Triune God, Father and Mother to us all, who in thy compassion didst grant to your servant Julian many revelations of thy nurturing and sustaining love: Move our hearts, like hers, to seek thee above all things, for in giving us thyself thou givest us all. Amen. Triune God, Father and Mother to us all, who showed your servant Julian revelations of your nurturing and sustaining love: Move our hearts, like hers, to seek you above all things, for in giving us yourself you give us all. Amen. The Lady Juliana was born about 1342, and when she was thirty years old, she became gravely ill and was expected to die. Then, on the seventh day, the medical crisis passed, and she had a series of fifteen visions, or "showings," in which she was led to contemplate the Passion of Christ. These brought her great peace and joy. She became an anchoress, living in a small hut near to the church in Norwich, where she devoted the rest of her life to prayer and contemplation of the meaning of her visions. The results of her meditations she wrote in a book called Revelations of Divine Love, available in modern English in a Penguin Paperback edition. During her lifetime, she became known as a counselor, whose advice combined spiritual insight with common sense, and many persons came to speak with her. Since her death, many more have found help in her writings. The precise date of her death is uncertain. Her book is a tender meditation on God's eternal and all-embracing love, as expressed to us in the Passion of Christ. She describes seeing God holding a tiny thing in his hand, like a small brown nut, which seemed so fragile and insignificant that she wondered why it did not crumble before her eyes. She understood that the thing was the entire created universe, which is as nothing compared to its Creator, and she was told, "God made it, God loves it, God keeps it." She was concerned that sometimes when we are faced wiith a difficult moral decision, it seems that no matter which way we decide, we will have acted from motives that are less then completely pure, so that neither decision is defensible. She finally wrote: "It is enough to be sure of the deed. Our courteous Lord will deign to redeem the motive." A matter that greatly troubled her was the fate of those who through no fault of their own had never heard the Gospel. She never received a direct answer to her questions about them, except to be told that whatever God does is done in Love, and therefore "that all shall be well, and all shall be well, and all manner of thing shall be well." Speaking of her visions of heaven and hell, she said, "To me was shown no harder hell than sin." Of our response to the sins of others, she said (ch. 76): "The soul that would preserve its peace, when another's sin is brought to mind, must fly from it as from the pains of hell, looking to God for help against it. To consider the sins of other people will produce a thick film over the eyes of our soul, and prevent us for the time being from seeing the 'fair beauty of the Lord'-- unless, that is, we look at them contrite along with the sinner, being sorry with and for him, and yearning over him for God. Without this it can only harm, disturb, and hinder the soul who considers them. I gathered all this from the revelation about compassion...This blessed friend is Jesus; it is his will and plan that we hang on to him, and hold tight always, in whatever circumstances; for whether we are filthy or clean is all the same to his love." "Glad and merry and sweet is the blessed and lovely demeanour of our Lord towards our souls, for he saw us always living in love-longing, and he wants our souls to be gladly disposed toward him . . . by his grace he lifts up and will draw our outer disposition to our inward, and will make us all at unity with him, and each of us with others in the true, lasting joy which is Jesus." Revelations of Divine Love is also available online - not in modern English. There is an Order of Julian of Norwich within the Episcopal Church founded in Norwich, Conn., in 1982. It is an order of both men and women who follow the spirituality of Julian of Norwich. It is contemplative in that its purpose and goal is simply the practice and teaching of silent and intercessory prayer. The Order follows the traditional monastic vows of Poverty, Chastity, and Obedience, and adds a fourth vow: Prayer. 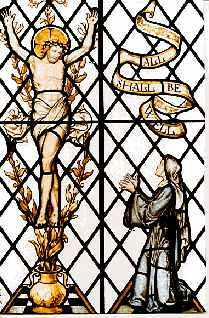 The picture above is a stained glass window from the cell of Julian of Norwich.